ANIMAL RESCUE AND ADOPTION TEAM INC.
Trap-Neuter-Vaccinate-Return is widely regarded as the most successful and humane method to reduce the feral cat population. WHAT IS A FERAL CAT? A feral cat is a cat born and raised outside with little or no human contact or is a stray that has lived outside long enough to revert to a wild state. Feral cats are elusive and do not trust humans. They are primarily the result of pet owners’ abandonment or failure to spay and neuter their animals, allowing them to breed uncontrolled. Ferals often live in groups, called colonies, and take refuge wherever they can find food. They live in the shadows —the alleyways, empty lots and condemned buildings. Their lives are short and usually harsh. They struggle to find food and water in an environment filled with the constant threats of disease, starvation, cruelty and predation. They are the abandoned, the lost and the wild—and they need our help. While a feral cat might look exactly the same as a pet cat, they’re actually very different. Feral cats are wild animals who typically avoid human interaction. They might respond positively to someone who feeds them regularly, but in a captive environment they would regress. When cared for, feral cats are happier outdoors in their own territory—they have their own hierarchies and are able to exhibit their natural behaviors. 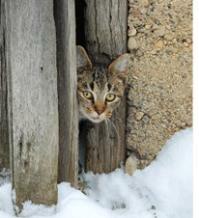 IS THERE A DIFFERENCE BETWEEN A STRAY CAT AND A FERAL CAT? Yes. A feral cat is primarily wild-raised or has adapted to feral life, while we define a stray cat as someone’s pet who has become lost or has been abandoned. Stray cats are usually tame and comfortable around people. They will often try to make a home near humans—in car garages, front porches or backyards. Most are completely reliant on humans as a food source and are not yet able to cope with life on the streets. It is an endless, cruel cycle and is extremely costly to taxpayers. Eradication, the deliberate and systematic destruction of a feral cat colony, by whatever method, almost always leads to the “vacuum effect”—either new cats flock to the vacated area to exploit whatever food source attracted the original inhabitants, or survivors breed and their descendants are more cautious around threats. Eradication is only a temporary fix. 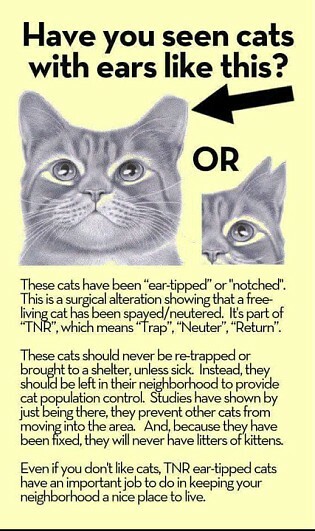 TNVR is the method of humanely trapping feral cats, having them spayed or neutered, vaccinated for rabies and then returning them to their colony to live out their lives. TNVR also involves a colony caretaker who provides food, adequate shelter and monitors the cats’ health. TNVR has been shown to be the least costly as well as the most efficient and humane way of stabilizing feral cat populations. Through TNVR, feral cats can live out their lives without adding to the homeless cat population. Spayed or neutered cats living in colonies tend to live healthier lives. By stabilizing the population, ferals will naturally have more space, shelter and food, and fewer risks of disease. Feral Cat FOCUS is an all-volunteer, non-profit organization dedicated to helping improve the lives of ferals in Western New York. Through outreach and education Feral Cat FOCUS serves as an expert on Trap-Neuter-Vaccinate-Return and supports the efforts of caring citizens humanely caring for feral cats. Feral Cat FOCUS advocates for changes to public policies that kill feral cats and promotes a humane and non-lethal approach to feral cat population control through Trap-Neuter-Vaccinate-Return. Feral Cat FOCUS sponsors affordable Trap-Neuter-Vaccinate-Return spay/neuter clinics for feral cats, free-roaming cats, and barn cats. The clinics are held in Lackawanna, NY. For more information on Feral Cat FOCUS or to schedule an appointment at a TNVR clinic please call 1-888-902-9717 (toll free) or visit www.feralcatfocus.org. You can also complete the online “Application for Spay/Neuter Clinic Appointment” form on the Feral Cat FOCUS website. Heart Animal Rescue and Adoption Team Inc.
©2018 HEART Animal Rescue and Adoption Team Inc.
Website Hosting provided by SM Digital Creations - 716-254-6130.